I may have mentioned on this blog that I have a lot of nail polishes. I may also have mentioned that many of my nail polishes are unworn, or as I call them: Untrieds. And many of my Untrieds are Illamasqua. 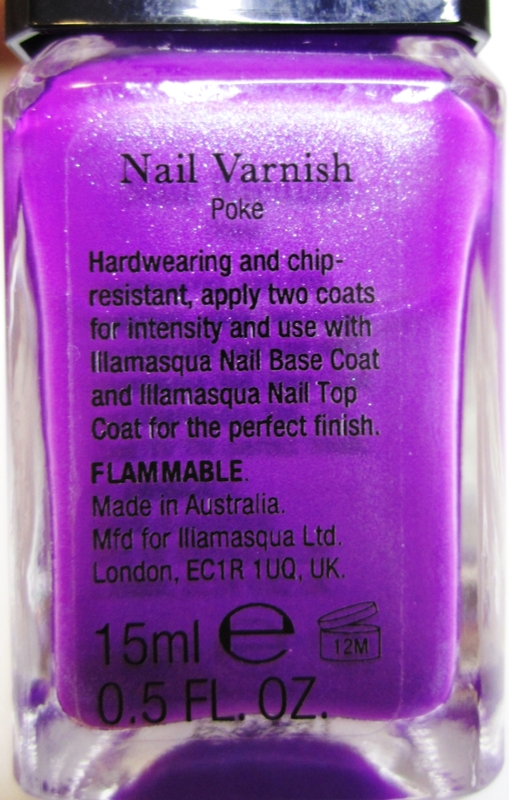 Today I bring you Illamasqua Poke. 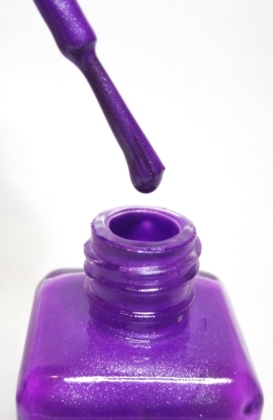 Bright violet purple, shimmer finish. Fairly accurate, and I would add that the shimmer is an icy blue micro-shimmer, which makes the violet lean quite blue-toned in certain light. I actually did not wear this colour on my fingers, but rather on my toes. But since this blog is a feet-free space, I will not be showing you how this looks on my toes. This nail polish is a One Coat Wonder (OCW)! Not very surprising coming from Illamasqua. Above swatch is shown with just one coat, no top coat. As with all Illamasqua nail polishes, the square outer cap can be removed and the smaller cap inside makes it much easier to grip when applying the polish. The brush is on the thinner side but it applies and deposits the polish very well – no streaks or unevenness. Close up shot to showcase the icy blue shimmer. Click to enlarge. Illamasqua nail polishes cost $17 CAD (when it was available at Hudson’s Bay, now the only place North Americans can purchase Illamasqua is online, and prices will vary depending on the £ conversion, and shipping charges are steep). They contain 15ml of product and are made in Australia (kind of an unusual place for manufacturing nail polishes – I don’t recall any other nail polish brands made there). It has a mix of warm and cool tones – I think it would be suitable for most skin tones. It is quite a bright purple shade though, definitely not work appropriate for more conservative environments. It is! Perks up my life, for sure! That’s beautiful. It’s an untried for me, as well. I hope it looks as good on me as it does on you! So disappointing that they’ve pulled out of North America…they’re a quality brand. Their makeup artists were great as well, never pushy and applied skillfully. I think their edgey look deterred the masses even though the core of their products were fairly tame, and really good quality! So refreshing to see a cruelty-free Australian cosmetics company, rather than some European or American brand, who sell their products in China (where animal testing is mandatory) and believe in dropping chemicals into rabbit’s eyes and watch them slowly lose their mind and die. On a happier note, the colour is gorgeous. Also, have you considered trying Kester Black nail polishes? They’re vegan and cruelty-free. Just bought this colour for $4.99 CAD! AMAZING! That’s awesome! Yes, I saw that Winners has a bunch now. It must be all the remaining stock from the Bay or maybe even Sephora. Australia. Hm… I don’t know any other brands that’s made in Australia either. I haven’t come across other nail polish made in Australia. Very odd, right.